Spruce Grove's City Centre, a Rich History. The City Centre is the oldest part of Spruce Grove and has experienced, like many other downtowns, a resurgence of great ideas to redevelop the area. There is a rich history of businesses and residents working together to develop and plan a successful City Centre. Some some strategies date back to 1982. Here is a timeline of the Spruce Grove City Centre development initiatives. 1982 - "Central Area Redevelopment Plan (CARP)." This plan was to provide the role and an identity for Spruce Grove's City Centre. 1991 - "Update to the 1982 Central Area Redevelopment Plan." The update to the 1982 CARP was prepared by the Edmonton Regional Planning Commission with the goal of strengthening the role and identity of Spruce Grove's City Centre. The updated plan was reviewed by a steering committee comprised of Spruce Grove City Aldermen, Department Directors from Economic Development and Planning & Engineering, the Chamber of Commerce and the residents of Spruce Grove. The Steering Committee decided the historic City Centre should be retained and promoted and that a vision was integral to the future of the Central Area Redevelopment Plan. 1997 - "Downtown Development Action Study (DDAS)." The City of Spruce Grove hired design and planning consultants to create a unified vision of the downtown. Stakeholders were engaged and a strategy was developed aimed at cosmetic and physical improvements, local business support and marketing and creating a pedestrian oriented environment. The function of the DDAS was to increase the appeal of the City Centre by enhancing its physical appeal. The issue came when parties involved could not agree on the amount of investment required and with some choosing not to contribute to enhancements. The project was then limited in completion. 2010 - "City of Spruce Grove's Municipal Development Plan (MDP)." The most recent update to the City's Municipal Development Plan was revised in 2010 under the "Your Bright Future" plan. This plan offers a geographical definition of the City Centre and addressed the revitalization in several sections. Future Land Use, Form and Infrastructure and Economic Development to develop the City Centre as a mixed use hub of activity with a distinct identity. 2014 - April - "Stakeholder Engagement Meeting." This meeting was attended by a number of land and business owners and the City of Spruce Grove. All came to voice their concerns, opinions and assessments of the economic and physical climate in the downtown Spruce Grove. They discussed perceived strengths, key issues and concerns, ideas to move forward with and an agreement to increase communication and buy-in from all parties. 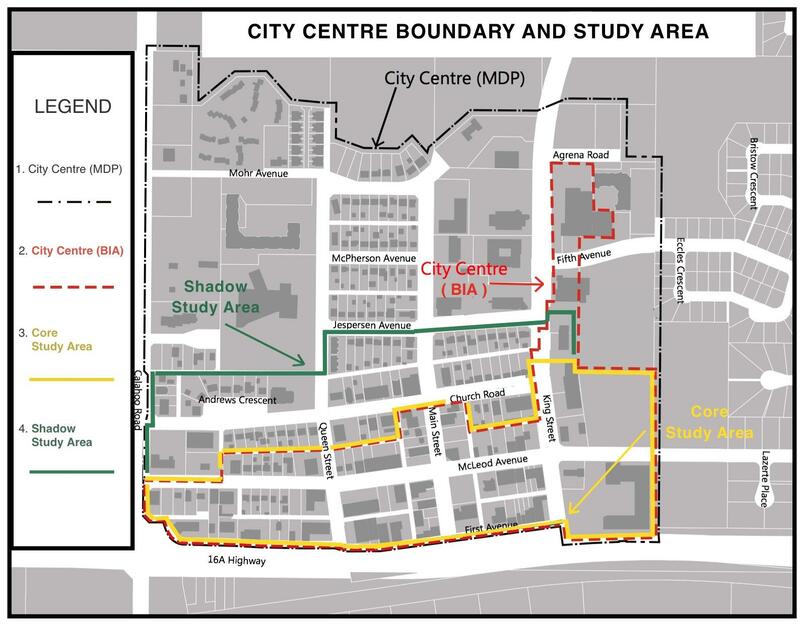 From this meeting, a study was to be developed to document the current status and situation analysis of Spruce Grove's City Centre as it relates to its viability for revitalization strategies and initiatives. The City of Spruce Grove commissioned Cushing Terrell to conduct a City Centre Revitalization Discussion Paper outlining the potential next steps for the City in how it could move forward in revitalizing the City Centre area. The paper is a document designed to stimulate discussion and identify considerations for the City to potentially pursue. The study was carried out over the period of April to June of 2014 where information was collected from many sources using several methods to prepare a list of City Centre revitalization considerations. The completed paper was put before City council in July of 2014. Council took the recommendations and incorporated that information into that year's City of Spruce Grove's Corporate Plan and all Corporate Plans to follow. Thus beginning a strong reinvigorated movement to revitalize Spruce Grove's City Centre! To read the entire discussion paper, click here. In response to a petition by businesses in the City Centre area to establish a BIA for the purpose of revitalizing the downtown, and to follow through on recommendations found in the City Centre Revitalization Discussion Paper, City Council approved the establishment of the City Centre Business Improvement Area (BIA)on June 17, 2016. Council also realized that, to be successful with the BIA initiative, an operating entity needed to be formed to oversea the BIA. Thus, the City Centre Business Association (CCBA) was formed on August 15, 2016 under the provision of Bylaw (C-966-16). Under the Bylaw, "the Council of the City of Spruce Grove received a request, pursuant to the Business Improvement Area Regulation, Alta. Reg. 93/2016, to establish a business improvement area generally located in the area of King Street extending west to Calahoo Road and from First Avenue extending north to the King Street Mall. The objects or purposes for which the Area is established are: (a) Improving, beautifying and maintaining property in the Area; (b) developing, improving and maintaining public parking, and; (c) promoting the Area as a business or shopping area by building effective partnerships with businesses, property owners, and municipal government, developing and marketing a positive image for the Area, attracting new businesses that support the vision for the Area, and encouraging reinvestment and future development in the Area." The CCBA will have an elected Board of Directors including a City Council representative as well as a part-time Executive Director. City Council approved the establishment of the BIA for the purpose of promoting the revitalization and redevelopment of the Spruce Grove City Centre. The focus of the Association to this point has been to sponsor events such as the Public Markets at Columbus Park and the annual Winter Fest to bring residents into the City Centre area. These events have been very successful and demonstrate an appetite to support the City Centre as a major community gathering site. These events began as a grass-roots initiative to test the community’s appetite to congregate in the City Centre and provide value to the businesses within the BIA. In 2016, a monthly Public Market took place throughout the months of July, August and September. Aside from the expected array of vendors and fresh produce to shop from, each Public Market was programmed with a specific theme in mind. The markets were deemed an astounding success, despite difficult weather at the final market in September. As a result of their successes, the Board decided to not only repeat the process for 2017 but they added a fourth market with a "Rock The Art Walk" to the roster. This proved to be a rewarding process that tested both the endurance and capacity of our young organization. The Spruce Grove Public Markets are already creating a measurable impact that is enhancing our local economic conditions, leveraging the available regional resources, and building local capacity for sustainable economic delivery that our tri-municipal area can benefit from. It is understood that at least part of the CCBA's annual budget will be funded by a Business Improvement Levy on businesses located within the BIA zone. It is also understood that, in an effort to keep the levy amount as low as possible, the CCBA will undertake a series of signature events to raise funds for the purpose of fulfilling their mission. One of the recommendations from the City Centre Revitalization Discussion Paper was to prepare a City Centre Area Redevelopment Plan (ARP). It was recognized that City Centre revitalization is a long-term process and will require a consistent vision and support to be successful. This ARP is intended to be the start of a more in-depth process to re-energize the City Centre as a gathering place and focal point for the community. The business community has taken ownership of the initiative and wants to partner with the City in bringing about change.